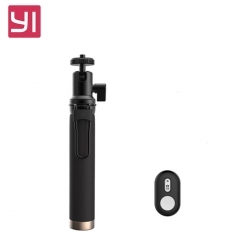 Amplify the possibilites to capture stunning photos and videos with the Yi Selfie Stick. Light, easy to carry and covered with a high-quality non-slip rubber, this monopod reduces shakiness and increase stability, making it easy to take shots with confidence. This 182mm length stick can be expanded up to 710mm and helps you take selfies and group pictures without asking people around for assistence. Featured with a swivel axis in its extremity, you can also position the camera at different angles. With aluminium surface and shock resistant, take this "must-have" accessory with you in all adventures.